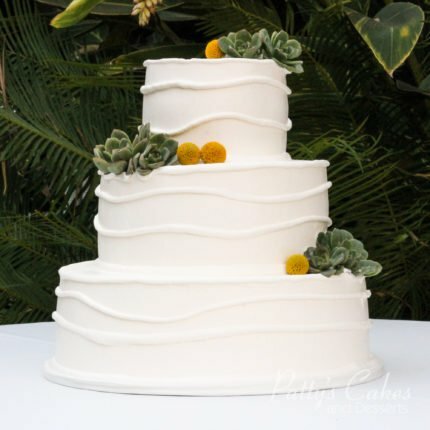 Patty’s has long been a favorite in my family, and they did a wonderful job with my wedding cake! They were very easy to work with, as well as accommodating with my request for additional gluten-free cupcakes to be delivered to my venue along with the cake. Everything arrived on time and looked (but more importantly tasted) wonderful! [Review] Cupcakes to Bring to Work! A rep brought a dozen cupcakes to work. It was mint flavored icing with chocolate cake. Omg, they were so good. I need to remember this place for the next time I need a cake or cupcakes. Patty’s Cakes was recommended to us by our vendor. They were accommodating, organized and helped us select our cake design and flavors. Prior to setting up the appointment, we had no clue what we wanted other than knowing our color scheme. However, they made the process easy and helped us find the perfect style that fit us and our wedding theme. We both have completely different tastes, but were recommended to try the lemon cake, which we both would have never thought to try on our own, and it ended up being the flavor we both independently loved the best! The cake was beautiful, and our guests loved it! Couldn’t have asked for more. Beautiful and delicious wedding cake! – From the beginning, we were very impressed with the professionalism of Patty’s Cakes. They returned our call, answered our questions, and set up a tasting appointment. We had a very good experience: discussed cake design, size, icing styles, and got to taste several types of cakes, fillings, and icing. We chose the lemon cake with raspberry filling; it was so flavorful and our guests really enjoyed it too. Thanks so much to Philip and Patty’s Cakes for our beautiful wedding cake! We have become regular customers of this awesome little cupcake and dessert shop. I have my favorites, but occasionally like to try new cupcake flavors. My wife is completely hooked on the chocolate chipper. Crispy potato chips on top make it extra special! I also like their little cake balls. I bought a Valentines assortment last month, which came in a great decorative little box. Every flavor was delicious! Can’t seem to go wrong with anything you get from this place. Someday I want to try their Thrifty ice cream. And next time we have company, we plan to try a frosted red velvet cake. Our wedding cake was a hit!! Had many friends and family ask where we got the cake from because of how delicious it was. The guest fave cake flavor was the white cake with raspberry and vanilla custard filling.